Rogue Amoeba on Friday released a new app that just might give Mac users pause. Intermission, launched at an introductory price of $15, gives you the ability to pause live audio on your Mac and pick it up later. It’s essentially TiVo, but for streaming audio on your Mac. Perhaps you’re streaming Internet radio, or live audio from a presidential address, or listening to a conference call, and then the phone rings. When that happens, you use the Intermission menu (or the global shortcut you’ve set) to pause that streaming audio. When you’re ready to resume the audio and turn back time, you can rewind with a green scrubber—as far back as three hours. Intermission offers controls for quickly jumping back just ten seconds if you need to hear something one more time, and for quickly returning to real-time, too. I tried it out with Pandora, and Intermission worked flawlessly. I hit its Pause button, and the green slider inside the Intermission menu showed a clock to indicate how far behind “real time” I’d gotten. When I chose Resume, the music immediately picked up where it had left off, and I could scrub through to go forward and backward in time. And the Jump Back and Jump Forward controls worked precisely as expected, too. 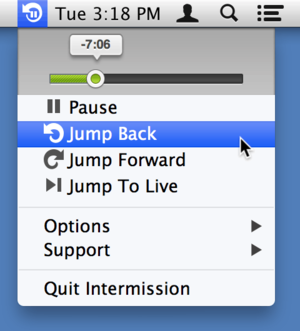 If you prefer your Jump Back and Jump Forward commands to leap backward and forward in intervals other than ten seconds, that time leap is customizable in Intermission’s preferences. Intermission smartly lets system sounds (beeps, new Mail alerts, IM notifications, and the like) bleed through in real time, even if you're buffered; otherwise you'd effectively be hearing those sounds on a tape-delay. Of course, if you rewind your Mac’s audio with Intermission during a conference call and then forget all about it, you may later press play on a YouTube video and get momentarily flummoxed when the audio doesn’t start right away. That said, the ability to back audio up and hear what you just missed or to pause live sound feels pretty impressive at first blush. The app works with OS X 10.7 through 10.8.4, but there’s a free trial available at Rogue Amoeba’s website. With the free version, your buffered audio starts including overlaid noise after ten minutes.